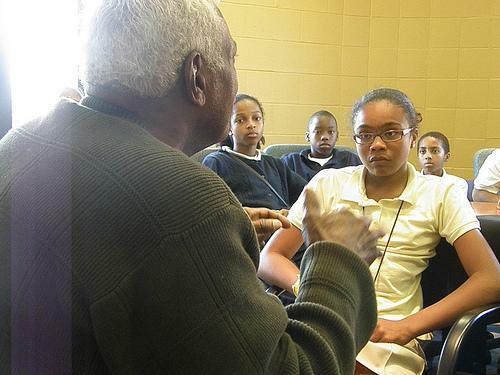 Sixth-graders taught by Haliday Douglas at City Academy, a private school in north St. Louis, produced a documentary about the civil rights movement in St. Louis. St. Louis alderman Freeman Bosley Sr. speaks to 6th graders at City Academy. 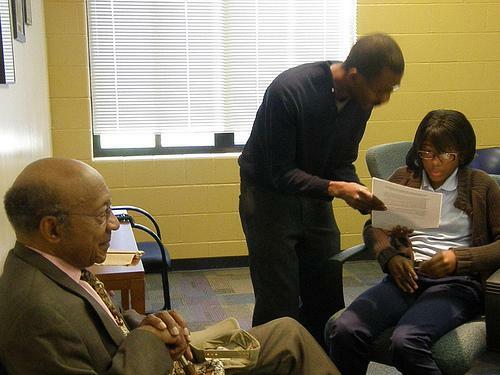 Bosley, a longtime civil rights activist and the father of the city's first black mayor, was one of the subjects of a documentary shot and edited by the 6th graders. 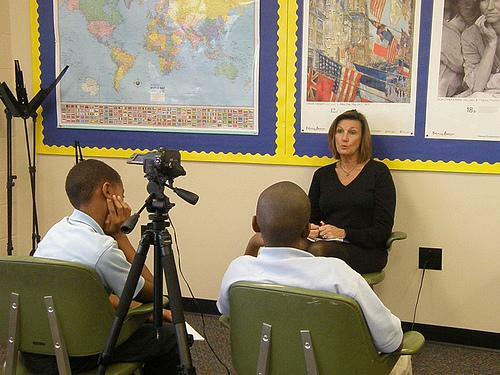 Sixth graders at City Academy interview Beth Louis, the granddaughter of Branch Rickey. As general manager of the Brooklyn Dodgers, Rickey signed Jackie Robinson to a major league contract, breaking the color barrier in baseball. On Wednesday, students at the City Academy, a private school in north St. Louis, will have a chance to view a civil rights documentary shot and edited by their schoolmates. "The Experiences That Shape Us" tells the story of local civil rights leaders like Percy Green, Frankie Freeman and Freeman Bosley, Sr. It was the brainchild of sixth grade teacher Haliday Douglas. 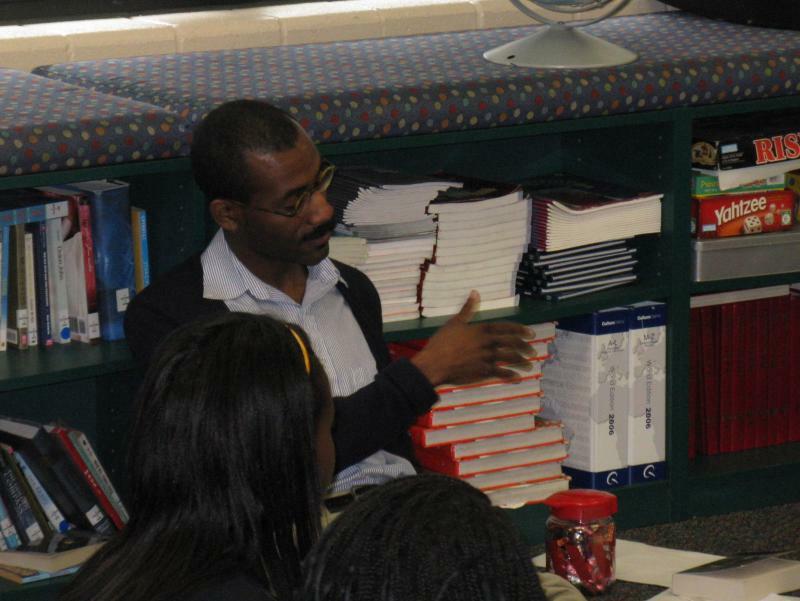 On using a documentary to teach civil rights: "When you study history, you use a lot of paper and pencil and books." This time around, it was very important for my students to not only have the information but the experience of using multimedia in their learning. "We wanted to basically take what we learned from the texts and really get a picture, a real picture of the context of the civil rights movement." On the documentary process: A summer intern and I used the time off to compile a list of possible subjects and questions. I also spent the summer studying slavery and "cotton culture." Students then did research, added to questions we had developed, conducted and recorded the interviews. "When we got back to school after winter break, students immediately began editing the film footage and condensing about 28 hours down to somewhere between 45 minutes and an hour and 15 minutes." On the name "The Experiences That Shape Us": "I don't one individual has complete authorship of everything they're doing, or everything they've done, or everything they've accomplished. Those accomplishments, those achievements, belong to a community of people, and as much as that's the case, we have to give credit to the people that make our current existence, the things that we enjoy possible." It's true for all Americans, but especially true for African-Americans. We have to pay tribute to those who put their lives on the line during the civil rights era. On lessons the students learned: They came to the realization that every single day of their lives, they are living among history. "I think there was a big disconnect before between what was then and what was now." "I also think a big thing they got from the project was an understanding of how far this country has come, and in some cases, with some of the more precocious students, there's a real sense of gratitude to those who've come before them." On the civil rights movement in St. Louis, his hometown: I'd never heard about the protest at Jefferson Bank. "I learned that the movement didn't hit St. Louis in violent ways, but certainly in ways that cause and helped bring about real change here." "I think if we hadn't had this project, I certainly wouldn't and I know my students would not have learned about anything about where we come from, what our local roots are. It's one thing to read about Martin Luther King and Rosa Parks and what happened down south. It's a whole 'nother thing though to realize that the space that you belong to was very much part of that scene and that what you see on a national level was echoed right here in your backyard."